The most important thing you can do after a workout is refuel*. From a physiological perspective, your body has just undergone a bout of physiological stress. After a weight-training session, your muscles are in a catabolic state, which means muscle protein breakdown is occurring. After a cardio or weight-training session your body also has depleted its glycogen stores, which are the body’s key source for energy during exercise. *For more information on pre-workout fuel, check out The Two Most Important Things You Can Do Before A Workout. By making an effort to refuel quickly after a workout, you can maximize your body’s ability to build lean muscle mass, prevent muscle breakdown and restore the cell’s energy reserves. The ideal timeframe for refueling is up to 30 minutes after a workout. These 30 minutes, sometimes referred to as the “anabolic window,” optimizes the body’s use of fuel. Although research has yet to narrow this time frame to an exact minute, it is best to think of your window as insurance. 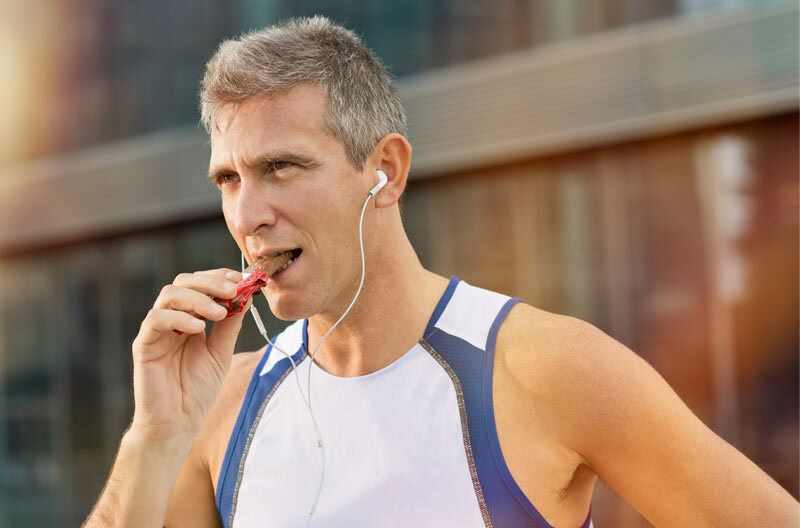 It’s easy to get distracted after a workout, but if you go hours without eating you miss out on the opportunity to prevent muscle breakdown and enhance muscle protein synthesis. Therefore, if you make it a priority to consume something within 30 minutes of completing your exercise session, you can avoid the risk of losing all of the benefits of your training session. It takes some effort and planning to optimize your training through refueling, but it is well worth it. After all, refueling helps the body recover, which will make your subsequent workouts that much more effective. Recommendations for post workout consumption include a carbohydrate-to-protein ratio of 3:1 or 4:1. Essentially, to optimize protein synthesis and restore glycogen, these ratios appear to do the trick. To make your post-workout consumption practical, think about bringing your shake or food with you to the gym or wherever you are training. Whey protein is a great post-workout protein option, as it is rapidly digested and can get into your muscles cells quickly. By keeping it in your gym bag, you can be sure to optimize your training and avoid worrying about when you can get access to food. Kelley VargoContributorKelley Vargo, MPH, MS, CSCS, ACE Health Coach is a recent graduate of the Milken Institute School of Public Health at The George Washington University where she received her MS in Exercise Science with a concentration in Strength & Conditioning and her MPH in Communication & Marketing. Ms. Vargo has contributed content to Discovery Health as well as the ACE Fitness Journal. She is a member of the International Society of Sports Nutrition, Delta Omega Public Health Honors Society, and a Metabolic Effect Instructor. She enjoys sharing her passion and energy with others, helping them create healthier and happier lives. Follow Kelley on twitter @kelleyvargo or contact her at kmvfitness@gmail.com or www.kelleyvargo.com. in finding this topic to be really something that I feel I’d by no means understand. manner? I’ve a challenge that I’m simply now running on, and I have been on the glance out for such info. just use the web for that purpose, and get the hottest news. I absolutely love reading all that is written on your website.Keep the tips coming. Wonderful items from you, man. I’ve be mindful your stuff previous to and you are just too wonderful. those secrets. My boys appeared to be absolutely joyful to read them and have now pretty much been enjoying these things. eager to be informed on. My very own sincere apologies for not expressing appreciation to you sooner. conceive the design and style contains wonderful features. enjoy the style and design it really stands out. for thoughts on this matter last Saturday. I would like to consider the ability of thanking you for your professional suggestions I have always enjoyed visiting your site. Hello.This post was really fascinating, particularly since I was looking for thoughts on this subject last week. specifically this very post. Your all so sweet along with thoughtful of others in addition to the fact that reading the blog posts is a superb delight in my experience. your tips is going to be put to good use. blog.Keep the stories coming. I loved it! could possibly have tried without the actual recommendations shared by you directly on this field. with a new expert avenue you resolved the issue forced me to weep over delight. know what a great job you were doing educating some other people through your blog. Most likely you’ve never met any of us. There is clearly a lot to realize about this. to reach their targets. Your new warm and helpful hints and tips entails much a person like me and even further to my office colleagues. Great job over again. I am looking forward for your next post! never have been complete without coming to your website. I conceive this site contains some very great info for everyone :D.
web I found this web site as a best web site for hottest updates. It?s hard to find knowledgeable people about this topic, but you sound like you know what you?re talking about! from. So we remember we have got you to be grateful to for this. fun, and that’s pretty fundamental. Thank you for the whole lot! publish only about gossips and internet and this is really frustrating. the smart ideas discussed by you relating to this topic. aid of your blog post. Most probably you have never encountered any of us. it contains great blog posts. I am glad to be a visitant of this double dyed web blog, appreciate it for this rare info! I like this weblog very much, Its a real nice post to read and get information. This internet site is my intake, real great design and style and Perfect content. this website would like to go on updated. Excellent info it is surely. We have been searching for this info. I’m taking a look ahead in your next put up, I’ll try to get the cling of it! him as nobody else recognise such designated about my difficulty. fantastic concepts you are placing on this website. cool times reading here. Thanks again for a lot of things. bit familiar of this your broadcast offered shiny transparent idea. an impressive task and our whole neighborhood will likely be thankful to you. BaCrf8 You made some good points there. I did a search on the topic and found most people will approve with your blog.